Thousands of Web services have been available online, and mashups built upon them have been creating added value. However, mashups are mostly developed with a predefined set of services and components. The extensions to them always involve programming work. Furthermore, when a service is unavailable, it is challenging for mashups to smoothly switch to an alternative that offers similar functionalities. 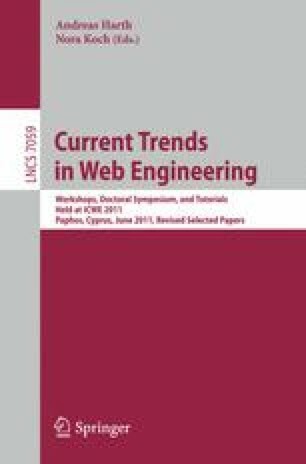 To address these problems, this paper presents a novel approach to enable mashups to select and invoke semantic Web services on the fly. To extend a mashup with new semantic services, developers are only required to register and publish them as Linked Data. By refining the strategies of service selection, mashups can behave more adaptively and offer higher fault-tolerance.